For August and September we are happy to present our annual Plein Air Painting show. Juried by Kathleen Walsh, this show is a beautiful celebration of the skill of local artists as well as the environment in which we live. 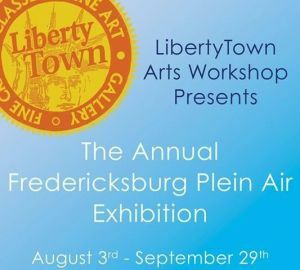 LibertyTown Arts Workshop is a 13,000 square foot gallery with over 40 local craftspeople and artists. Here our artists create and show right on site in 27+ active studio spaces. We have potters, wood workers, welders, blacksmiths, oil painters, pastel artists, water colorists, and fiber art.